Everyone from south Louisiana remembers flooding being a problem whether it was from Hurricane Katrina, or the Great Flood of 2016. So many people lost their homes to natural disasters in such a short time frame. We are still seeing flood houses from last year that haven’t even been touched since the flood. It’s so sad to see how long of a process these people are going through just to get back home. Whether they are fighting insurance companies or they’ve gotten their insurance money but it isn’t enough to fix their homes. Some of our own Expand team members lost their homes as well. One family had two children, one of which was a newborn who they had to wait in a bathtub outside for help to come get them from their home and bring them somewhere safe. We know what it’s like to not have clothes to wear and the panic of “Where do I go now?” on the mind. As you all know, Hurricane Harvey hit Texas about a week ago, and it hit hard. A lot of the labor force that was working on homes in Louisiana left to help Texas and now, a lot more may be headed to Florida after Hurricane Irma hits. Expand will be staying in Louisiana to continue helping with the homes in our own area, but we made sure to make a point of doing what we can. 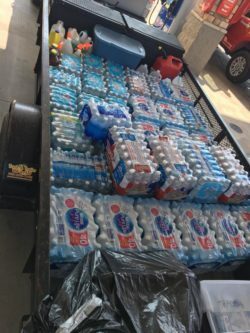 One of our team members Tommy Ashley III took time out of his own weekend to gather supplies and money from people wanting to donate but not knowing where to send it, and drove with a couple of other people he recruited to Texas to help where they could and disperse supplies to those who needed it. We are proud to have such a great person on our team that would voluntarily drive through flooded areas, horrific traffic, and take however many hours out to put all of this together. This was his own project and we know it was very close to his heart as Texas used to be called home for him, and he lost his own house in the flood last year. 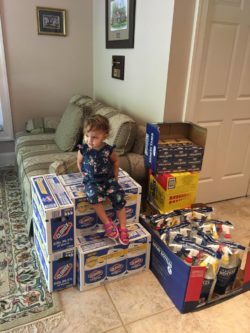 Thanks to Danielle Murphy, Bobby achord of Bobby’s Electric, Buddy achord, Lukas Bueno & Emmery Ashley for delivering all of the supplies gathered! 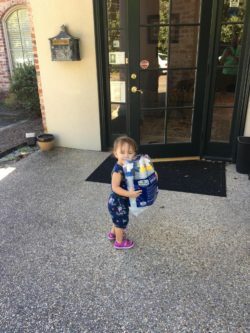 Here are just a few pictures of some of the supplies they gathered and delivered: And to top it all off, our youngest team member Emmery, coming in at 1 year old and also the newborn who waited in a bathtub last year, donated supplies to the Capital Region Builders Association this morning to go to the Harvey Relief efforts. CRBA members will be bringing supplies from multiple companies from our region to donate to the victims of this horrible flood. As Louisianans we know what these people will be going through this next year. It’s our turn to be the supporters instead of the victims. A lot of us are still dealing with the effects of the Great Flood of 2016, so take those feelings and let Texas, and most likely Florida, know that we are with them and that we support them 100%. 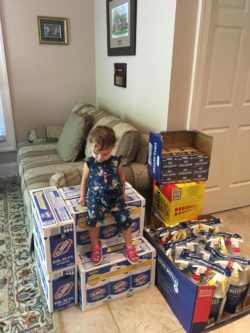 They will need everything they can get. And for anyone dealing with the flood, or hurricane damages, know that we are thinking of you and helping in any way that we can. We hope you get to your homes as soon as possible, but know that all of that can be replaced. If we learned anything from this flood, it’s that we are safe and unharmed and even though we lost our belongings and proof of our memories and past, we are around to make more memories and buy more belongings. It may not make the process much easier, but know it could have been worse. We love you Louisiana, Texas and Florida! 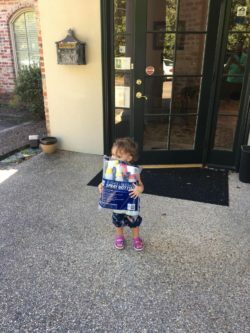 Let us know if there is any way we can lend a helping hand.If you have any questions on where to send donations or supplies, feel free to contact us at meagan@remodelingbyexpand.com or our office number at (225) 791-8050. The Capital Region Builders Association is still accepting both cash donations and supplies as well. -Meagan, Expand Inc.